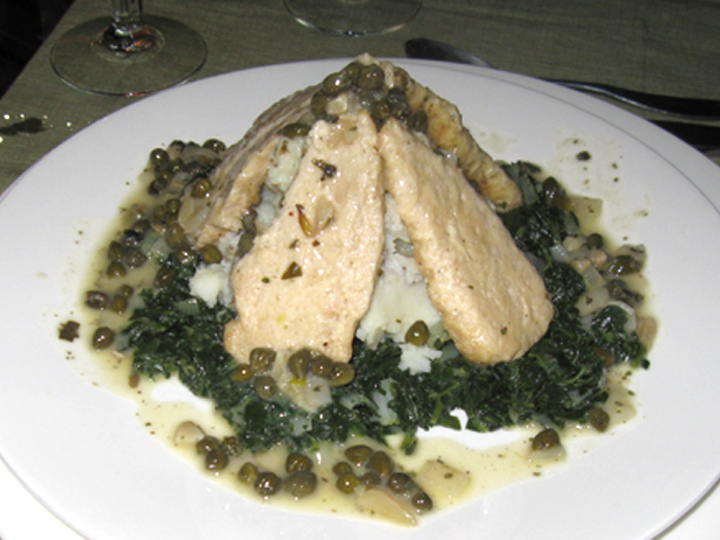 Seitan piccata is a very popular entree in a number of upscale vegan restaurants, because it is so, so good. Here is the recipe you can make at home for a dinner party, a romantic dinner for two or any occasion. *If using the homemade vegetable broth, you may need to add salt to this recipe and leave out the powdered vegetable bouillon. 1. In a large pot, bring 1 gallon of water to a low boil. 3. In a large bowl, whisk together all the wet ingredients and the fresh herbs; (i.e., the water and or vegetable broth, oil, soy sauce, and red wine) stir in to the dry ingredients just until combined. 4. Form into a loaf shape. 5. Place gluten loaf on cheesecloth and roll up (not to tight). Tie each end with a piece of string. Then tie the Rosemary Sprig on the outside of the cheese cloth with the 4 other pieces of string (like a traditional Roast). 6. Place in simmering water, covered, for 1 hour*** (2 hours for a double batch). Heat a large sauté pan and add a tablespoon of extra virgin coconut oil (or another high temperature cooking oil) until the oil begins to smoke slightly. Add the breaded seitan medallions and brown on both sides. Put browned medallions on an oven-proof platter or sheet pan in a 200 degree oven. In a glass pie plate or large bowl, mix the dry ingredients. In a separate glass pie plate or large flat soup bowl, mix the wet ingredients. Dredge the medallions in flour then dip in the soy milk mixture then back in the flour mixture, shake off the excess and refrigerate until ready to sauté. Watch our Food Show on making Seitan Roast in our series on Seitan Piccata With Garlic Mashed Potatoes. Hi, thank you for sharing the recipe. I’m going to try it. I hope you don’t mind me writing also that the name is misspelled. It should be written with double ‘c’ and one ‘t’ = piccata. This is one of the first recipes we ever posted. Let us know how it turns out.